Gold and silver futures advanced their winning streaks on Monday to four straight sessions, and each posted a more than five-week high. Gold for August delivery moved up $11, or 0.9%, to end at $1,286.90 an ounce on the Comex division of the New York Mercantile Exchange. The settlement was the highest since May 6. "Safe haven demand was featured amid growing concerns about the U.K. vote next week regarding an exit from the European Union (Brexit)," Jim Wyckoff, a senior analyst at Kitco Metals Inc., said in a report. Gold futures ranged from a low of $1,275.20 to a high of $1,290.30. They advanced last week by 2.7%. Silver for July delivery rose 11.3 cents, or 0.7%, to close at $17.443 an ounce. Like for gold, the settlement was the highest since May 6. 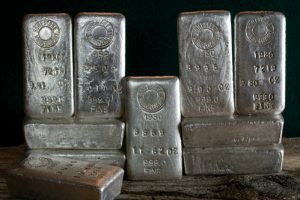 Silver prices traded between $17.10 and $17.47. They rallied 5.9% last week. July platinum edged up $1.10, or 0.1%, to $995.30 an ounce, ranging from $984.70 to $999.70. Palladium for September delivery dipped 10 cents to $545.85 an ounce, trading between $536.10 and $553.75. The two metals split last week with platinum 1.3% higher and palladium 0.6% lower. Gold rose $4.50, or 0.4%, to $1,280 an ounce. Silver was unchanged at $17.32 an ounce. Last week, London pricing for palladium was unchanged while the other metals registered increases of 2.8% for gold, 7.6% for silver and 1.7% for platinum. United States Mint bullion sales were unchanged Monday. Earlier in the day, the U.S. Mint said it is limiting this week’s sales of American Silver Eagle to 1,672,500 coins. 2016 American Silver Eagles are running at a record pace with 24,327,500 sold, representing a 31% increase over those sold through same time in record-breaking year 2015. The Mint saying it is “limiting” sales of its silver American Eagle bullion coins to 1,672,500 coins this week is a moot point & silly actually since the Mint’s 13 worldwide billion coin Authorized Purchasers have not purchased the total weekly allotment in many different weeks for almost 2 months now. The APs left over 40 percent of the silver coins offered last week on the table unsold. Demand for this bullion coin is now firmly in the doldrums! The market is vastly oversaturated with these ASE bullion coins. But finally people can’t complain that the Mint is not minting enough. This is leading to some better deals from the APs that buy and sell the silver eagles. Do you want to buy a rare MS-70 2016 ASE from me? There are only about 20M out there! You are so right! MS-70 ASE coins are common & MS-69 ones are common as sand! Just ask yourself how a bullion coin stacked all touching each other in the US Mint plastic tubes can ever get a 70 grade considering NGC says 70 means no scratches viewed with a 3x loupe! Crazy!